Visible crew/equipment: When Leon is walking down the street, right before Crockett jumps in his car, the camera crew are visible in the shop windows the entire length of the scene, moving along with Leon. 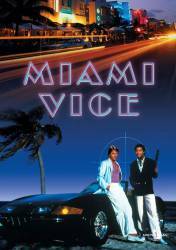 Visible crew/equipment: In the scene where Crockett and Tubbs first meet at the deal, after the cops bust the deal too early, Tubbs steals Crockett's boat to get away. As he's driving the boat away, you see a second person kneeling down in the back of the boat, most likely a crew member. Very obvious. Visible crew/equipment: When Crockett and Tubbs are being escorted by boat to Bramlette's hideout by his wife Cassie, in a shot from the riverbank you see that Don Johnson and Philip Michael Thomas have been replaced by doubles. Although their backs are to the camera, it's plain to see that they look nothing like the actors who they're replacing. Especially Crockett's. Other mistake: When Tubbs and Castillo are talking in the entrance way of the Senator hotel, at the end of their dialogue Philip Michael Thomas makes a very clear gesture with his right hand, which is Don Johnson's cue to finish his phone call in the background and approach the others. Continuity mistake: According to the ballistics report, the Jamaican hitters use "Interarms" (instead of Interdynamic) KG-99 submachine guns. However, the lead thug actually uses a Smith & Wesson M76, and his cohorts Jimmy & Winston use Star Z70s.